The campaign against hate speech and discriminatory statements in the Turkish Parliament does not cover “sexual orientation, gender identity and gender expression”. It has also been revealed that gay and trans people are excluded from the scope of protection. The campaign against hate speech and discriminatory statements in the Turkish Parliament does not cover the statements “sexual orientation, gender identity and gender expression”. It has also been revealed that gay and trans people are excluded from the scope of protection. The parliamentary question from Sezgin Tanrıkulu, Deputy Chairman of the Human Rights Commission of the Turkish Parliament, of the Republican People’s Party (CHP), received a response. The above mentioned parliamentary question on the “prevention of usage of hate speech and discriminative statements in Grand National Assembly of Turkey” submitted to Turkish Parliamentary Speaker’s Office was responded to by Sadık Yakut, Turkish Parliamentary Deputy Speaker. MP Yakut from Justice and Development Party (AKP) referred to parliamentary immunity in his response and he reminded [the minister] that “according to the Bylaws of Grand National Assembly of Turkey, a person who utters rude and hurtful statements in the General Assembly will be immediately warned by the Chairman, requested to leave the floor in the case of that person’s insistence on speaking and may be excluded from the session if the Chairman deems it necessary”. Sadık Yakut, Deputy Chairman of Grand National Assembly of Turkey, attracted attention to the Political Ethics Conciliation Commission’s bill of law on preventing hate speech and discriminative statements in the Assembly, which was finalized in December 2012 and submitted to the Parliamentary Speaker’s Office. In this bill of law from the Commission, which was established with the purpose of developing a clear, honest and accountable understanding of politics and defining ethical principles by making a detailed examination on political ethics, the principle that “any discrimination due to such reasons as language, race, color, gender, political opinion, philosophical belief, religion, age, physical, mental and psychological disabilities shall not be in question” was indicated. The fact is statements such as “sexual orientation, gender identity and gender expression” were not indicated and trans and homosexual people’s exclusion from the scope of the protection attracted attention. In his response, Mr. Yakut also shared the [names of] MPs who received disciplinary punishment in the 24th Term of the 3rd Legislative Year of the Turkish Grand National Assembly. TBMM Başkanlığı “milletvekillerinin, danışmanların, yasama uzmanlarının ve yardımcı personelin nefret söylemine karşı farkındalık düzeylerinin artırılmasına” ilişkin olarak ise TBMM’nin Etik Komisyonu’na işaret etti. The Presidency of the Grand National Assembly of Turkey pointed to the Assembly’s Ethics Commission regarding “increasing the level of awareness of parliament members, consultants, legislative experts and supportive personnel against hate speech”. 1- Is any kind of mechanism projected which follows, assesses and plans the required steps through analysis on hate speech (or speech which have a high potential of being understood as hate speech) by MPs? 2- Which sanctions are applied or could be applied against hate speech and discriminative statements by MPs? 3- In the previous legislative year, was any provision of a by-law or any other legislation applied due to hate speech, discriminative statement or revilement? If yes, in which cases was it applied? 4- Does the Parliamentary Speaker’s Office plan on any project to increase the awareness and responsibility levels of parliament members, consultants and party group management of hate speech and discriminative language? Milli Gazete Cover Page, 25 November 2014. Part 1. Annotated. Click for full size. Milli Gazete: Invitation to morality! Following Turkey’s first gay wedding, the couple lost their home and their jobs and began receiving death threats. There are women among those who have been threatening the couple. 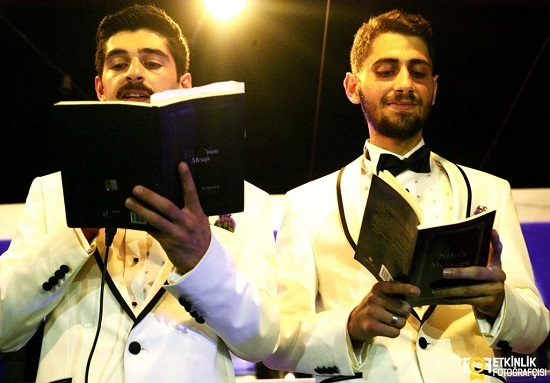 Turkey’s first gay “wedding” turned the couple’s lives into a nightmare. University students Ekin Keser and Emrullah Tüzün recently got married in Istanbul through an unofficial wedding ceremony. Hürriyet’s Fırat Alkaç reports that the couple’s lives became entirely distraught following the ceremony. 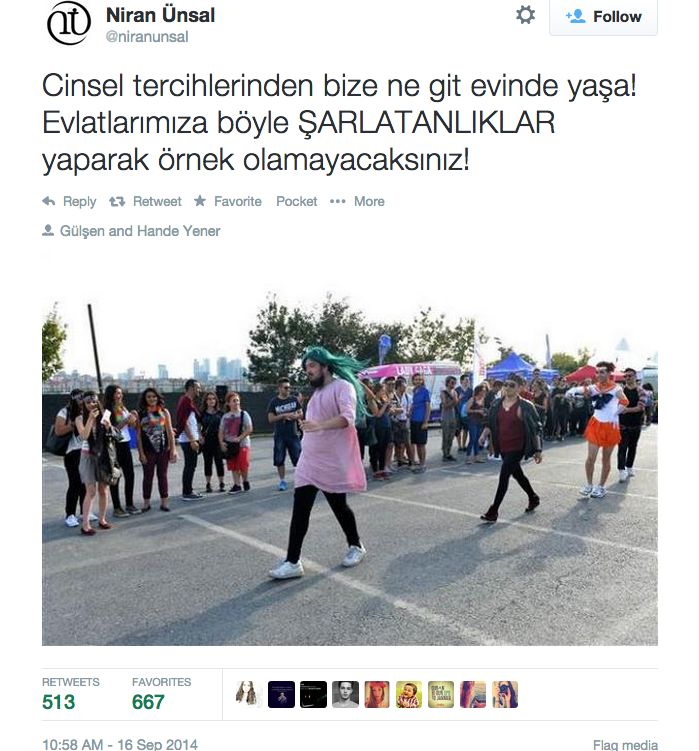 The news story later mentions that Ekin Keser is a university student and that Emrullah Tüzün is not. However, at this point both were referred to as students. The translation sticks to the original news content.